A great blog post by Sara Ciavarella about her week at the Massachusetts Institute of Technology (MIT) Sloan School of Managament in Boston with ASL’s CEO, Dr John McKeon, and CIO, Dave Morrissey. 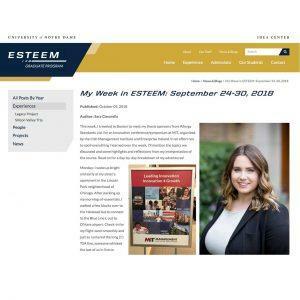 Sara is an ESTEEM graduate student at the University of Notre Dame. The ESTEEM program is a master of science degree program which emphasises the action of entrepreneurship and focuses on skills to launch new businesses, become innovators and be leaders of dynamic and innovative teams. ASL team is very happy to be working with Sara on her thesis and is very looking forward to the cutting-edge innovations that this will bring to the company. Click here to read the full blog post about Sara’s adventures at the MIT.